Just curious for the forum. What would you like to see in a 6U/ Wiard style layout that is not available to date? With the explosion of module types in Euro, it seems that some of the concepts could be adapted to 6U. Modules that follow a no menu-diving WYSIWYG layout given the larger panel space. Modules that complement and expand upon the current 300 series design. 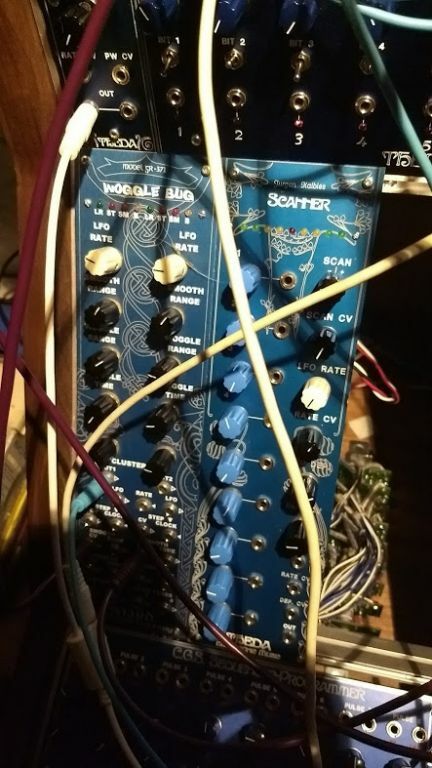 Personally, I was thinking about a (relatively) low-fi sampler module, something that utilized 12 to 14 bit sampling with an analog filter ala the SP-1200 (which was 12 bit). It could be a double wide module like the Cyndustries Dual Zero to allow for sliders along with pots. I'm personally giving all my available time to module development, but it takes so long to do it right. BTW I don't have any other full or part time work and I have given up several hobbies to do this. One of the issues with going the "modern" route of high powered DSP on a chip, is that to do it in such a way that suits the perfectionist nature of the format, the power supply really needs to be +/-15V, 5V with excellent power distribution. 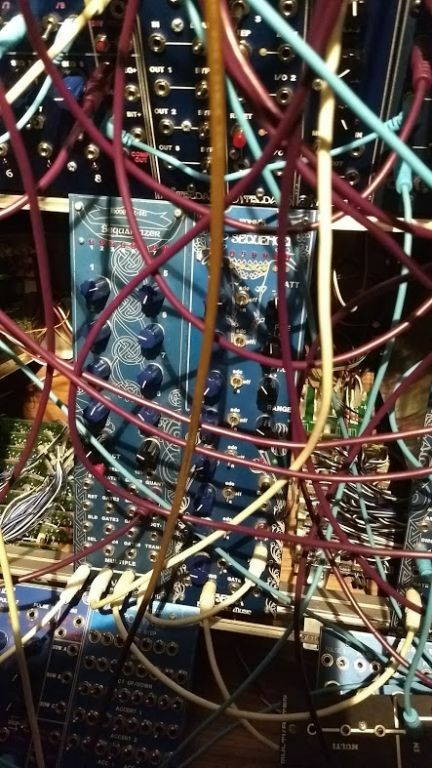 Lots of these modules pull 250mA straight from +ve and dump all of it onto 0V. A well designed analogue module can pull +/-250mA and need only route a few % of the total draw onto the 0V. The new use of balancing does make high quality standalone rack mount machines like Eventide a natural companion to the format. I think it would potentially help the format to encourage DIY experimentation, but I don''t think there's anything stopping anyone from trying! If there's something you really want get experimenting! A generous friend is donating me an Axoloti programmable DSP with analogue I/O. I think P Lord had a bunch of modules built into the Wiard format. From my perspective I quite like contained units - Grant had a particular design in mind for the 300 and I like that. My frac was sort of designed by me and I changed direction half way through and that's nothing like as satisfying. if i do need something that's not in the 300 i get it from the Frac - usually it's a utility or a Wiard frac ..but even then i wouldn't particularly want the 1200 series in 300 format. I'd love to see more gate/logic utilities. But, my favorite thing about the 300 series is the unified aesthetic. I have a wiard-format Chaquo, but want to replace it because the different placement of knobs and jacks upsets me. I know that might sound kind of silly, but the consistent look and feel of the modules is one of the things that drew me to the format. I really liked pairing the 300 with some of the mutable modules. Seems like the one territory you can't cover with the Wiard is granular/sample based synthesis. Also digital modal is lacking but not entirely missing with the Waveform City. Something like a dual clouds would be fantastic, or maybe an elements + clouds. +1 on this. I always favored the ergonomics and aesthetic of the 300 series > anything else. It's well designed. Also just a note, and you probably already know this but there's a decent amount of logic you can pull from the mixmod on the envelators with different patching scenarios. Also some bizarre stuff in the low mode on the Waveform City. But yeah a dedicated logic module would be amazing. Also just a note, and you probably already know this but there's a decent amount of logic you can pull from the mixmod on the envelators with different patching scenarios. Also some bizarre stuff in the low mode on the Waveform City. But yeah a dedicated logic module would be amazing. Care to expand on that? I think Grant says that the mixolator is one of the more complex modules but there isn't too much in the manual other than panning, VCA and "ring mod". Re waveform city I assume you mean the LFO / sequence shapes you can get out of it? IT isn't too difficult to make panels for Wiard 300-style modules, using front panel designer, if you measure (IMPERIAL measurements! Not metric.) one of the existing modules with a steel ruler, it's fairly obvious where the LED holes, pot holes and socket holes go, and if you take care, the format is adaptable, IE you don't actually HAVE to have 8 x LED, 10 x pot, 2 x switch, 20x socket, you can shift stuff around a bit and still have a module that looks OK racked alogside the "genuine article" The pics are of panels I made for the Fonic VC pattern sequencer and JH's interpolating scanner. As you can see, I fukced up the scanner, I made the holes for the LEDs a bit low, oh well. I also built it wrong too, it doesn't work! Need to debug it but somewhat lacking in time what with working away a lot. I've been thinking a lot about amplifiers and recovery circuits which are most of the battle with a spring reverb. The 6U format would be especially suitable because of the shielded enclosures. Could do a couple of enclosures with mumetal (like good transformers) if the extra cost can be justified by the higher performance (aluminium shielding does next to nothing at low frequencies), and the user understands not to knock the panel or it will need to be re-annealed. THAT2180 VCA/LPGs with sine shapers/wavefolders first. tempo syncable LFO with fluid flow computer (AKA Navier Stokes equation) after. Id totally spring for a 300 series dual delay, esp if it were a tap delay, and if it could be ran in parallel and series. BBD or digi, I think itd be an awesome addition. Agreed. A spring reverb would fit the case and a BBD delay would be a nice side-by-side contained within the module in 300 format.